Rice Lake WI, July 30 – Sam Fankhauser won his first Street Stock feature win of the year Saturday night at the Rice Lake Speedway as the Street Stocks had one last tune up before Tuesday night's “Little Dream” race. In other racing action, winners included Curt Myers, Kevin Adams, Michael Truscott and Dustin Doughty as well as A. J. Diemel who won the One Main Financial Late Model event that was a part of the program. The five weekly divisions that race at the speedway ran a full program as well as the special Late Model event for the One Main Financial Series with one hundred and one cars signing in to race. 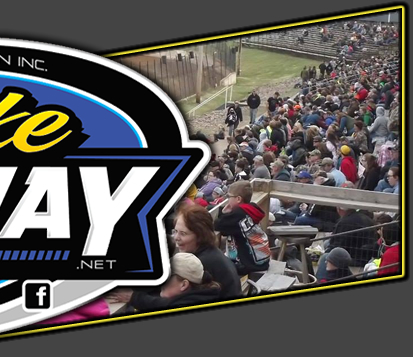 So, with the Late Models, a jam packed pit of one hundred and twenty six cars made for a big night of racing in front of one of the biggest crowds in several years on a great Summer night for dirt track racing. It has been a rocky year for Fankhauser with things just not going his way from time to time. In fact, he even stepped away from the track for a brief time recently but he was back in full force Saturday night as he recorded one of the most dominant wins of the year in the class. He did start on the pole but he totally dominated the strong twenty car field as he led from start to finish and it wasn't really that close. He immediately stepped away from C. J. Wagner to take the early lead as Wagner battled to hold off Ron Hanestad and Karl Genett. Two early yellows in the first six laps kept the field bunched but after that, it was green flag racing to the finish. With things settling down, Fankhauser pulled away from the field while the battle behind him was hot and heavy with Hunter VanGilder and Kevin Bogdanovic making the biggest moves. Both came from the third row to race their way into second and third respectively but neither had anything for Fankhauser. Eric Olson looked good in his new ride as he battled for position with Jay Kesan and Cody Kummer among others, with the positions on the track being swapped on every turn. But for Fankhauser, he was a happy and relieved winner as he became the seventh different Street Stock winner so far this year and appears to have peaked at just the right time. VanGilder had a solid run for second ahead of Bogdanovic with Kesan and Kummer rounding out the top five. Myers continues his charge as he looks to win a second straight national title in the Super Stock class and the Rice Lake Speedway has been very good for him this year as Saturday night's win was his sixth of the year here, tying him with Jason Havel as the top winner at the speedway. Brandon Duellman visited for the second time this year and he had a solid run as he led the opening laps after fighting off an early challenge from Jim Cimfl. Duellman continued to show as the leader while Myers, Simon Wahlstrom and Nick Traynor worked their way toward the front. Myers went to the cushion and he charged forward after starting eighth and he soon had tracked down Duellman for the lead. With a power move off turn four, Myers flew by on the outside and took over the top spot. As the race remained under the green, Myers started to cruise while the battle for second heated up as Wahlstrom caught Duellman for the position. They had quite a race for the spot before Wahlstrom took the position. Myers continued to motor on and with no yellows to bunch the field, he drove on for an easy win. Things got tight for the second spot though, as Wahlstrom was starting to have mechanical issues and he barely eased his way across the line for second before required a wrecker to return to the pits. Duellman finished a solid third with Eric Olson making a late charge up to fourth and holding off Shane Sabraski for that spot. Adams appears to be back on track after going through a tough period of his own in recent weeks. Making only the second start in his new car, he led from start to finish to record his third Modified feature win of 2016 at the speedway. However, despite starting on the outside pole, he had plenty of challenges in the early going. A stubborn Steve Hallquist was not anxious to relinquish the early lead and they had quite a battle before Adams was able to slide past him into the lead. Then it was Mike Anderson who came storming up to battle for the lead with Adams. Several yellows for minor spins slowed the action with Adams continuing to get the jump on the restarts and maintain the lead. However, Anderson was under the gun as he was now being challenged by Cory Mahder for second. They traded the second spot back and forth through a couple of yellows before Mahder was able to secure the runner up slot. The last eight laps of the event ran nonstop and Adams was finally able to gain a little distance on the field. 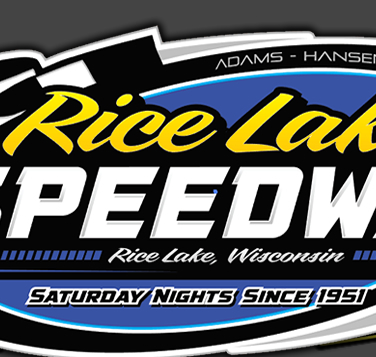 However, Jeremy Nelson, making his first start ever at Rice Lake became the driver on the move. He got past Anderson in the late going and nearly stole second from Mahder, with Cory just holding on for the runner up honors. Anderson settled for fourth as he held off Dave Cain for that spot. It was an interesting evening for Michael Truscott that started out with a first lap crash in his heat. However, he recovered from that to win that event and then with a strong drive he went to the high side to drive around Kent Baxter and record his third Rice Lake Midwest Modified feature win of the year. Baxter and Dan Kingsley had a strong battle for the lead early before Baxter edged to the front. Kent led a number of laps and it looked like he might be in line to take the win. However, Truscott moved up the track and found plenty of traction as he drove past Kingsley and then closed on Baxter. Kent pushed for all he was worth but Truscott was just too quick on the top side and Michael drove into the lead in the late going. Several other drivers spotted the quick top side around the same time and Ryan Viltz raced into third where he ran out of time to challenge Baxter for second. Kingsley hung on for fourth and a late charge by Mark Thomas allowed him to complete the top five. Doughty won his second Pure Stock feature win of the year at Rice Lake as he held off the strong challenge from George Richards to hold on for the win. Doughty started on the pole, moved into the early lead over Dusten Holub and was scored the leader of every lap of the Pure Stock main. However, the final laps were anything but easy as Richards had systemically moved his way up from the third row, gaining on each restart and at the end, he was tapping on Doughty's bumper. George actually got a nose under Dustin on the last lap but Doughty fought him off and the two drivers, who respect each others' driving , raced clean to the checkered as Doughty edged out the driver who built his car. Mike Chaplin raced with the leaders throughout the event as he recorded his best finish of the year in third with rookie Cole Varsho again providing a solid finish. Jason Havel was mired at the start in ninth and had to drive hard to complete the top five. 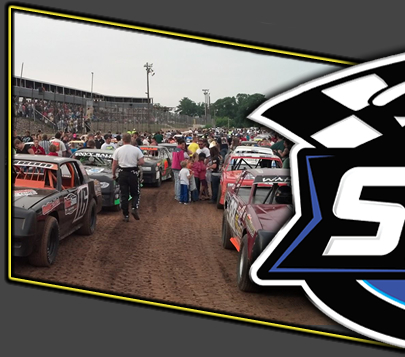 This coming Tuesday night, August 2nd, another of the premier events on the Rice Lake Speedway will be held as the twenty second annual Street Stock “Little Dream” race will be held. Modifieds are also on the card for the race which will begin with warmups at 6:30 pm. The rain date is Wednesday, August 3rd. A reminder also that there will be no racing at the speedway this coming Saturday, August 6th. Racing will resume on August 13th which is Hall of Fame night.